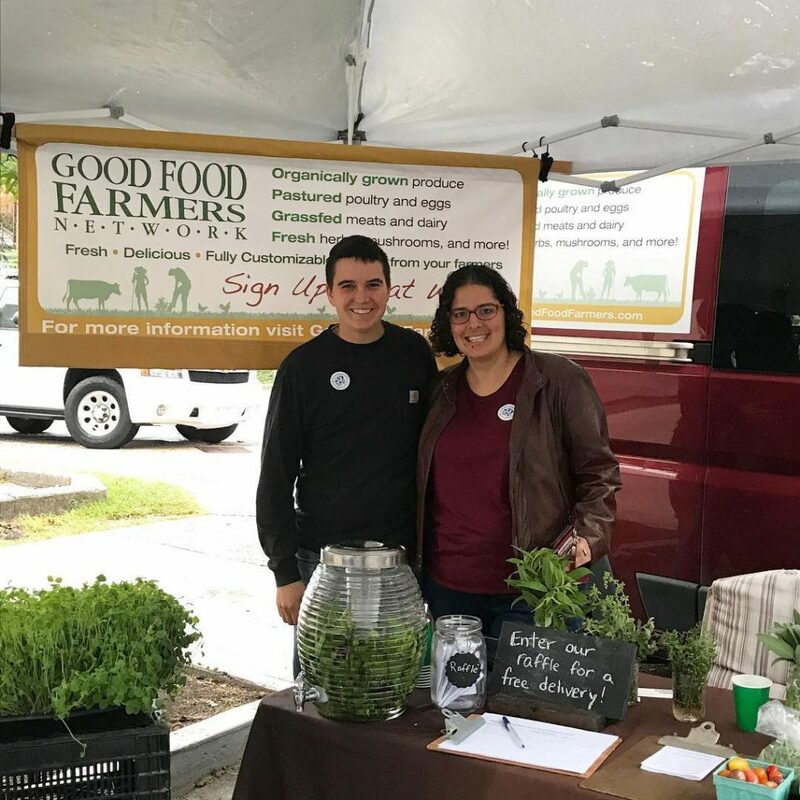 In 2014, I, with support from my partner, Sara Querbes, founded Good Food Farmers with fellow farmers Jen and Jon Ronsani of Lineage Farm and Claudia Kenny and Willy Denner of Little Seed Gardens. We had a simple goal: to support small-scale and beginning farmers by connecting with people who share our passion for food that is fresh, local, just, and sustainable. Good Food Farmers has evolved considerably since then. In fact, some members may remember the early years when we distributed produce from bulk bins in a borrowed van in a church parking lot. We have learned a lot since then and continue in our efforts to create a farmer-owned platform for delivering food that is flexible for our members and offers only foods grown to the highest of standards by great farmers – both beginning and long-established – in our region. We feel fortunate to have a community of members and member-farmers who believe wholeheartedly in what we are trying to achieve and who inspire us to grow, innovate, and overcome challenges. Because of this, I am excited to announce some new developments. One big change you may not have yet noticed directly is the growth of our team. The past two years have seen most of the work done by myself, Dan, and Lia. Many of you know Dan, who does an incredible job delivering all of the food each week as well as handling many of our backend logistics. Lia has been instrumental over the past two years packing bags and focusing a sharp eye on quality. New this year is Zach who brings both vegetable farming experience and a background in marketing. And later this Spring, we will have Sarah and Ivana joining us in a part-time capacity to help pack orders each week on the farm. Read everyone’s full bio’s here. With this extra help, we will be able to better serve you and new members in your neighborhoods who we hope will join Good Food Farmers this year. Another exciting change is the launch of this new website. From this website, we’ll be sharing more information, provide direct links to all of our farms, provide resources for cooking and storing produce, post featured recipes, stories from our farms, and more. We hope it will serve as a useful resource for all things food and farming. And be sure to follow us on instagram and facebook @goodfoodfarmers, as we’ll be announcing new content and more. Alongside the new website will be a brand new ordering platform for GFF members. One of our goals is to make it easier for you to eat, share, and enjoy farm-fresh foods. We realize our current platform, while functional, is not ideal. With our new ordering platform, we hope you will be able to more easily customize and update your orders on any device. If you need help using the new online store, we have created this post to assist, though please don’t hesitate to email or call anytime. Finally in May of this year, after many years in the works, we will be opening a licensed kitchen on our home farm, Dog Wood Farm. We are building the kitchen specifically to serve Good Food Farmers, both for you our members and for the farms in the network. We will be creating a vast array of foods that will be offered for sale on the new ordering platform. You can look forward to soups and salads, dressings and marinades, prepared meals and farmer-style meal kits, and much more. We will also be hosting numerous on-farm events that we will be welcoming you to attend. Eventually, we will be getting our In the Kitchen at Dog Wood Farm youtube channel started with cooking tips, follow-along recipes, and more. Our hope in all of this is to provide you with the foods and resources you need to make the most of what our farms have to offer. Farming is a challenge full of risk and unpredictability, but your participation and support of Good Food Farmers and our member farms gives us hope and helps to make our farms successful. Together we have the capacity to transform our food system into one that is just and sustainable, built on human connection and ecological balance. As I write this note, the seeds are being planted and soon our farms will be abuzz with the sounds, smells, and activities of Spring. There is much to look forward to and we are glad to be on this journey with you.